The NMBCC Library has a 225 sq ft multipurpose Exhibit Room available for reservation and use by students, faculty or staff. This space features a picture rail running about 12 inches below the ceiling along the top of the walls; there are three windows, facing out toward the stacks, with UV protective coating. 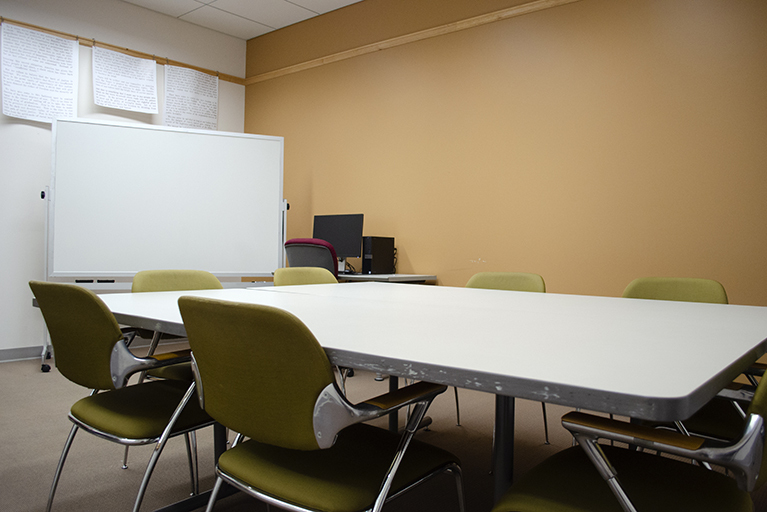 The Exhibit Room may be reserved by students, faculty or staff for a variety of uses (meetings, lectures, discussions, large group project work, and film screenings). This room can also be reserved for exhibits of framed art and photos. Noise level should be kept to a minimum because the room is not soundproofed. No rehearsals are allowed. To reserve the space, contact NMBCC library staff via email at bcclib at indiana dot edu. When scheduling, please include any requests for additional tables, chairs, or other equipment, so NMBCC staff can coordinate with the Facilities Coordinator.